Starting from today i am participating is a new challenge. 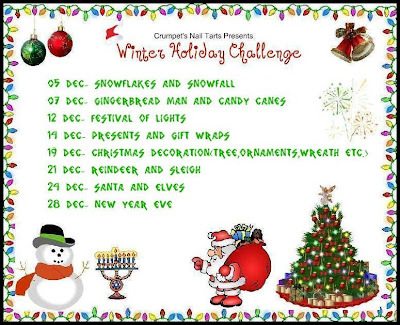 Winter Holiday Challenge have different themes based on winters, Hanukkah, Christmas and new year. I am so excited about this challenge and hoping you will all enjoy the posts. Hope u guyz like this mani. Please do comment and check what other girls come up with below. thnk u Puja.. m excited to see what you come up with. it looks like a picture scenery!! pretty!